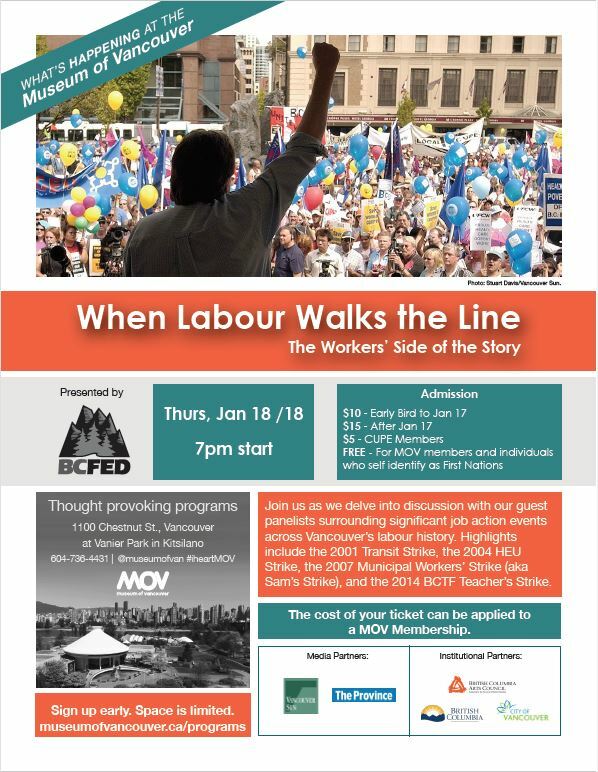 President Aliza Nevarie will be speaking at the Museum of Vancouver on Thursday, January 18 as part of the When Labour Walks the Line : The Workers’ Side of the Story event. Guest panelists including Aliza are participating in a discussion about significant job action events that have occurred in Vancouver’s labour history – specifically the 2001 Transit Strike, the 2004 HEU Strike, the 2007 Municipal Workers’ Strike (aka Sam’s Strike), and the 2014 BCTF Teacher’s Strike. CUPE Members pay a discounted admission fee of only $5, and individuals who self identify as First Nations pay no admission.